Open Door Mercy Home is a group from USA that teamed up with SAM in 2012. 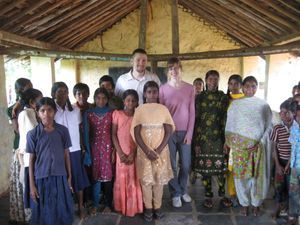 Please visit their site for more information on the boys and girls currently residing in 2 separate homes in Eluru, India. If you are keen to help, please donate or sponsor a child today! Being called by God to consider sponsoring an orphanage and supporting quality education for disadvantaged children, a short-term mission trip team from Toronto (Mr. Nelson Kung, Mrs. Fanny Kung, Dr. Ken Tung, Ms. Cythia Chan, and Dr. Joshua Raj) met with local ICM church workers in 2011. After assessing the needs, 20 orphans were identified to be housed in the ICM compound, with free housing and education. Reverend Kung and Fuller Life Church of Toronto pledged $500 CAD/month to run the Boys Home for 1 year! We praise God that Fuller Life Church of Toronto started the process of making this home an avenue to uplift some of these destitute children. The building that initially housed 20 orphan boys was expanded to include girls due to Open Door Church (ODC) of Edenton, USA under the leadership of Mr. and Mrs. Reagan Rippy. In 2012, Open Door took over sponsorship of all the children! They provided funds to expand the living area, dug a well to provide fresh water, donated 13 laptops, and sponsored an Internet connection to help the children in their education. PLEASE SPECIFY "ODMH" ON YOUR DONATIONS.